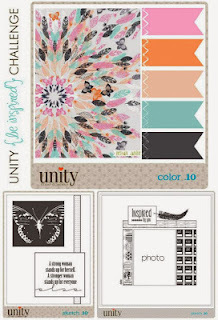 Today I'm sharing an art journal page for the Unity Friends With Flair today. This page is exciting for me because I used a new-to-me color combination and some untouched beautiful Unity stamps. I never knew neon could be so gorgeous! There are multiple layers and elements going on with this page (cuz we know when something doesn't look right... put more gesso on top!). The main elements are the beautiful Unity stamps: "Donna Downey Peony", "You are right where you should be" (Donna Downey), and "Tattered Chicken Wire". I wasn't getting the coverage I wanted with my usual StazOn ink, so I just coated all the stamps in black acrylic paint... and they stamped perfectly! That will probably be my go-to from now on. In the photo above you can see some of the neon ink chicken wire stamping. Another new-to-me product... GLITTER MOD PODGE! Why have I gone a decade of my life without it?! So here you see the entire page was given a generous coat of glitter mod podge. Why wouldn't it be? A date stamp and a couple fun rub-ons finish this page. I'll be playing with neons again in the very near future! Most of my supplies used are listed in the thumbnail images below. Items not shown: black and white acrylic paint from Golden, teal and fuschia acrylic paint from Americana. Don't forget to stop back throughout the weekend! Beautiful! I love the colors and the sentiment! Glitter mod podge is new to me, too - I will definitely be looking for that on my next trip to Michael's! Gorgeous artwork. So lovely with those big flowers and perfect sentiment. Very nice. I wouldn't have gone with those colors too but just look how awesome!! I need to be more adventurous with color. Great journal page, Rachel. Lovely color combo and mix of images. pastel, dreamy & glistening! LOVE it. So artistic & beautiful! Love the pink and mix of colors! WoW!! SO pretty!! Great inspirational page! Love the colors and all of the layers! Gorgeous! Love the layering of stamps and the bling! Mod Podge is awesome all by itself but with glitter??? I need to go get some! Beeeeautful Rachael and adore the colors and sparkle!! I love your bright neon colors! And I love even better that you were able to stamp with acrylic paint. I'm going to try that. Brilliant! WOW! this is perfectly beautiful!! The colors, the flowers, the glitter.. i LOVE this! Simply Beautiful, Rachel!! I LOVE the colours, design, and the glitter - such a wonderful design. Amazing!! This is lovely! Makes me want to start an art journal. This is beautiful Rachel. Glitter Mod Podge??? I agree...why didn't I know about this. I'm afraid today (for football) it will be Bear Down and Out-LOL! Awesome page! I really like the colors and the stamps that you used. Oooh! So pretty! Perfect for the challenge! What a great page! Loving the colors! Don't you just love it when everything on a page comes together beautifully? such a pretty page! You just make it beautiful and look so easy!